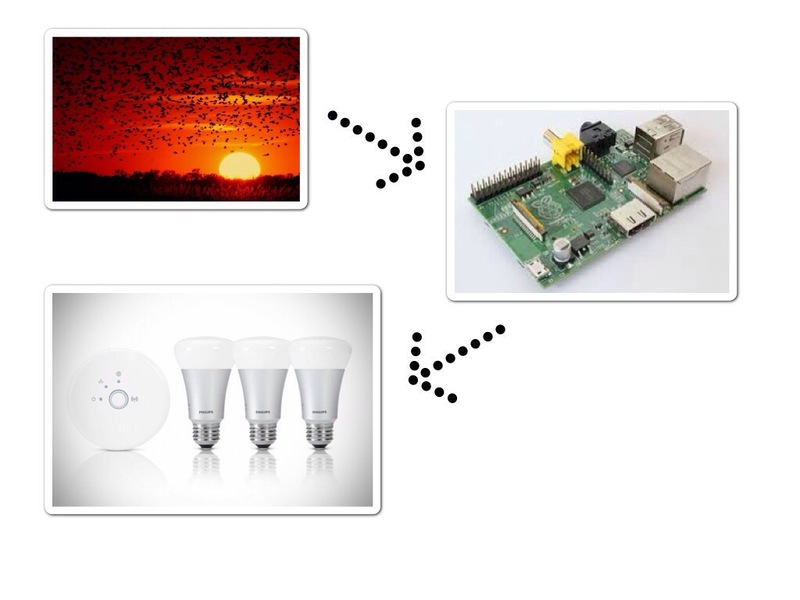 This post shows you how to control the Hue light bulbs using a Raspberry Pi. In particular, it shows you how to fade up your lights half an hour before to sunset. In true Heath Robinson style the solution is rather convoluted. But hey, that’s where the fun resides. 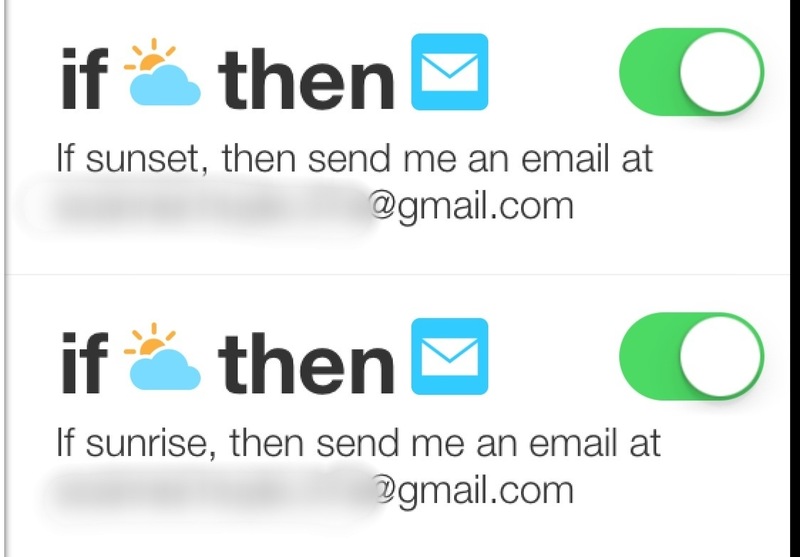 First, we set up IFTTT to email us sunrise and sunset times. This involves setting up two recipes triggered based on the weather channel. Now we need to set up a Python script to read our Gmail. To set this up I first, via the Gmail web interface, set up the account to auto-label emails from IFTTT containing the word “Sun” as “Sun”. This makes the emails easier to read as we then only need to read the email ‘folder’ “Sun”. The email reading script is similar to that used in the previous post. The code ‘reads’ the emails using the imaplib Python library. It extracts the subject lines, which indicate the sun event (“Sunset” or “Sunrise”), the date and the time. It then stores a datetime stamp in an SQLite database with a text field indicating the event type. This Python script is then scheduled to run (via cron) overnight. Now we write a little Python script to fade up all our Hue light bulbs. This has become a lot easier since Philips launched the official Hue API and documentation in March 2013 (fair play to Philips – I think this is done really well). First go to the Getting Started page of the Hue Developers site. Follow the simple steps there to add and authenticate a new user. Next we write the code. In short summary the Hue API works using an HTTP PUT request. This passes a JSON object (basically a string) containing ‘variablename:value’ pairs that sets the state of a bulb. More detail is found on the Hue Developers site. To fade up I use the ‘transitiontime’ variable, which I set to 6000 (6000*100ms=10minutes). To be snazzy I use xy values for the D65 standard illuminant – [0.32,0.33]. Another nice colour, with an orangey sunset feel has xy values of around [0.43,0.53]. ip = "[Your Bridge IP Address]"
PS: I did try to use a for-loop to iterate through brightness values from 1 to 255 but this caused some buggy behaviour – the lights would flash and jump in brightness. The ‘transitiontime’ variable is a great improvement. Finally we have my favourite bit – editing a cron tab via Python to schedule our fade up script half an hour before sunset. The documentation can be found at the above link. The comments in the code below will hopefully explain how to use it – it’s pretty simple. The only trick is to work out the syntax: [crontab object]. [crontab field].on([value]) sets that field value, for example: cron.minute.on(5) sets the minute field to 5. Also you need to clear each field (e.g. cron.minute.clear()) before setting using .on() otherwise it add the value to the existing value (e.g. an existing value of ‘0’ and the previous would give ‘0,5’). In the code below the first function extracts the time of the last sunset from the database and returns hour and minute values for a time half an hour before yesterday’s sunset (the trick to that is to use timedelta). Also remember with cron to use absolute paths in your code – cron jobs are typically run as if you were in your home directory. The above code is scheduled to run once a day sometime after midnight, after the script to read my emails above. At some point I’ll get all this on to github. Update: I have finally added the code (updated in places) to github: https://github.com/benhoyle/Hue. Hey presto. My lights turn on half an hour before sunset everyday!